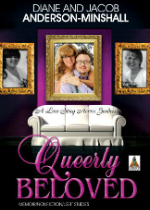 Queerly Beloved: A Love Story Across Genders by Diane and Jacob Anderson-Minshall is a creative non-fiction account of Jacob’s transition from female-to-male, told from both Jacob’s perspective and his wife Diane’s. The book explores the many ups and downs of transitioning and the effects that can have on a relationship, identity, and for this well-known couple, the status of “professional lesbian,” as Diane puts it, in the publishing world. Each author has headed chapters and Jacob’s are sometimes called “Suzy” to denote when the story takes place pre-transition. Their story starts when Diane meets Suzy in 1991 (or 1990 – as they discuss later, neither of them are sure of the exact date) and she describes Suzy as having model-looks, a beautiful woman who was “part Joan Jett and part Cherry Currie” in an old high school photo. For Jacob the narrative begins 17 (or 18) years later at QLiterati!, a monthly queer literary magazine the couple ran in Oregon. 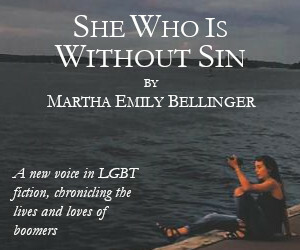 This jump forward illustrates the longevity of their love and the close-working relationship they have as active writers and editors in the LGBTQ community. But Diane is struggling to cope with Jacob’s transition. Throughout their story Diane is supportive in every way she can be, but deals with an intense feeling of loss. The timeline moves around, recounting early tales of Jacob’s reflections on how his childhood impacted his gender, and much of Diane’s story is her quest to become pregnant and her past work with successful lesbian magazines. As a trans man reading Queerly Beloved, some of the best detail for me was Jacob’s physical and emotional changes from hormone therapy. But the insight into Diane’s highly driven and successful magazine career was engaging and a good eye-opener for those who may want to work in publishing. The most interesting section of the book, though, was near the end when Diane and Jacob become foster-parents in a program working with adjudicated youth. Although their story up until this point was interesting, due to perhaps their closeness or the fields they write in, their style was very similar and many of the same scenes were retold by the other spouse without much of a fresh angle being added. But in the foster-parenting section Jacob and Diane’s voices shine through as individuals and there is a real depth of feeling. Although Jacob’s transition has been a major event in their lives, foster-parenting seemed to actually have even more impact on both of them. I would have liked to have read more about this, and would happily read another memoir by the Anderson-Minshalls based mostly on that topic. Queerly Beloved will have particular appeal for trans men and their partners, as well as those who are fans of the authors’ previous work, or writers interested in creative non-fiction. 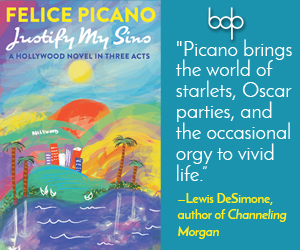 It is a lively story, often brutally honest, told with humor and integrity.